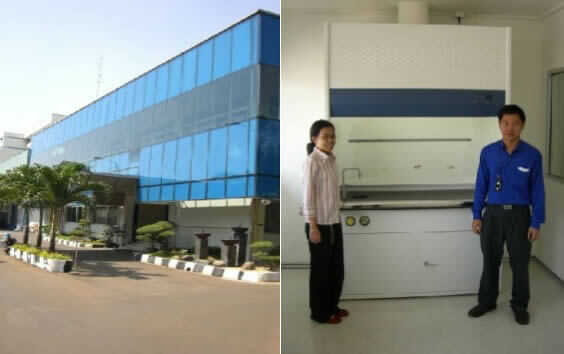 PT Bintang Todjoe is one of the major wings under the PT Kalbe Farma Group, Indonesia's leading pharmaceutical company. It has newly set up a laboratory which will be fully functioning soon and it deals mainly with drug delivery systems. According to Andriyani Wagianto and Richard Prayogo, both research officers in the new laboratory, their main aim is to come up with alternative ways of drug delivery aside of the usual oral consumption and injection. To make sure its research officers are fully protected from the toxic vapours and fumes they could possibly handle, they have equipped their laboratory with a 1.8m wide Esco Frontier Mono Fume Hood and an Esco Airstream Laminar Flow Cabinet. PT Bintang Todjoe would most likely be further equipping their laboratory once it starts full operation and Esco looks forward to a successful cooperation with PT Bintang Todjoe..